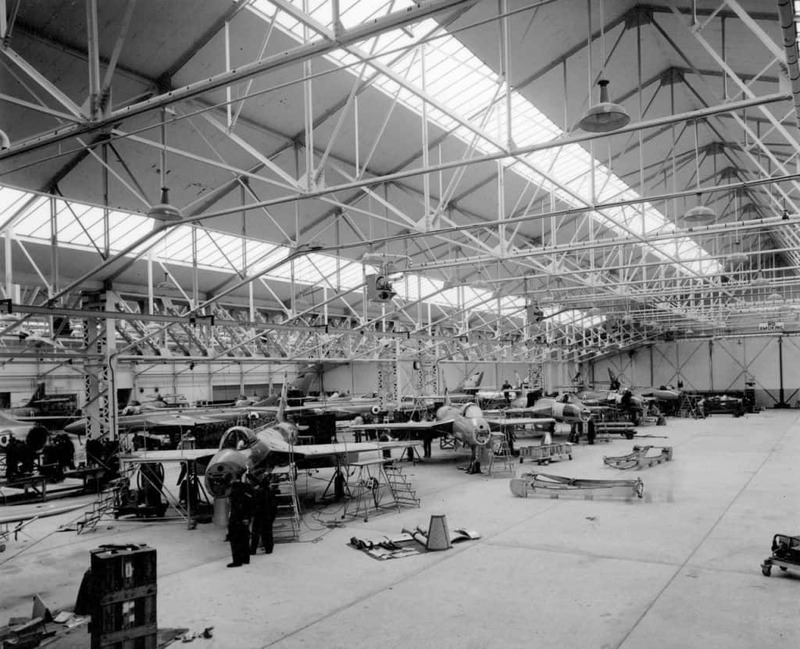 A number of interesting images from the early 1950’s has been recovered recently. Many thanks for the contribution by Russell Powell. Hunter 1. Hunter Erection Line No. 2 Bay Left hand view, neg number H2453 21-06-1954. Hunter 2. Hunter Erection Line No. 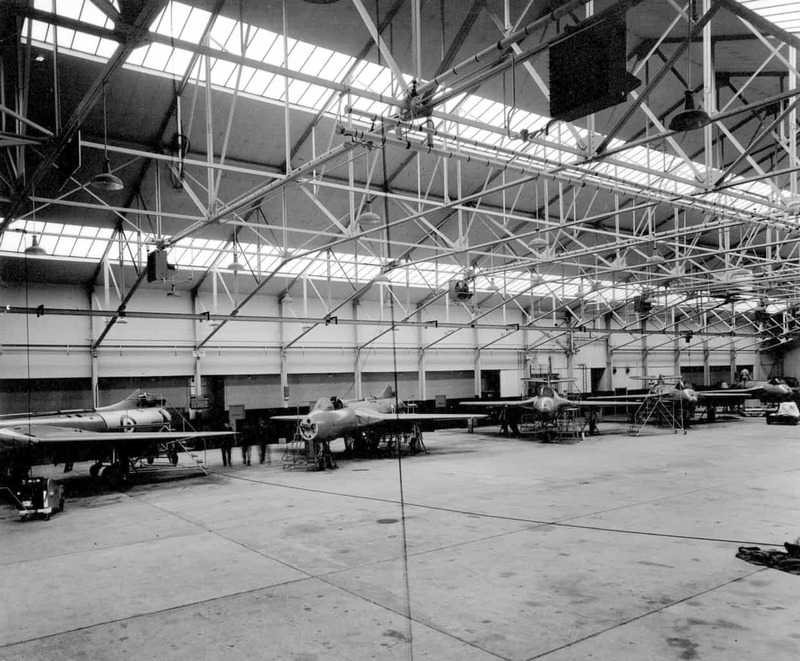 2 Bay Right hand view, neg number H2452 21-06-1954. Hunter 3. Hunter Erection Line No. 1 Bay, neg number H2451 21-06-1954. Hunter 4. 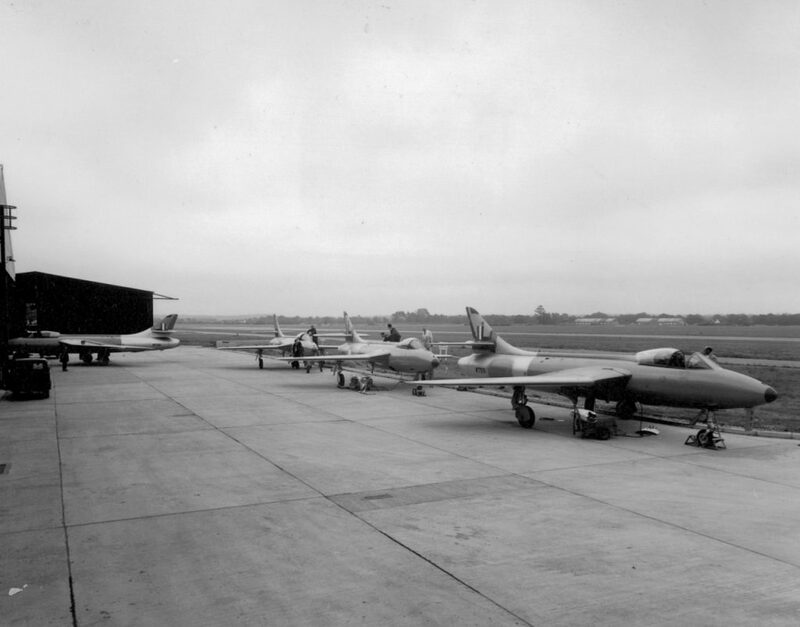 Hunter Aircraft cleared Flight line preparing for Delivery, neg number H2454 21-06-1954. Hunter 5. 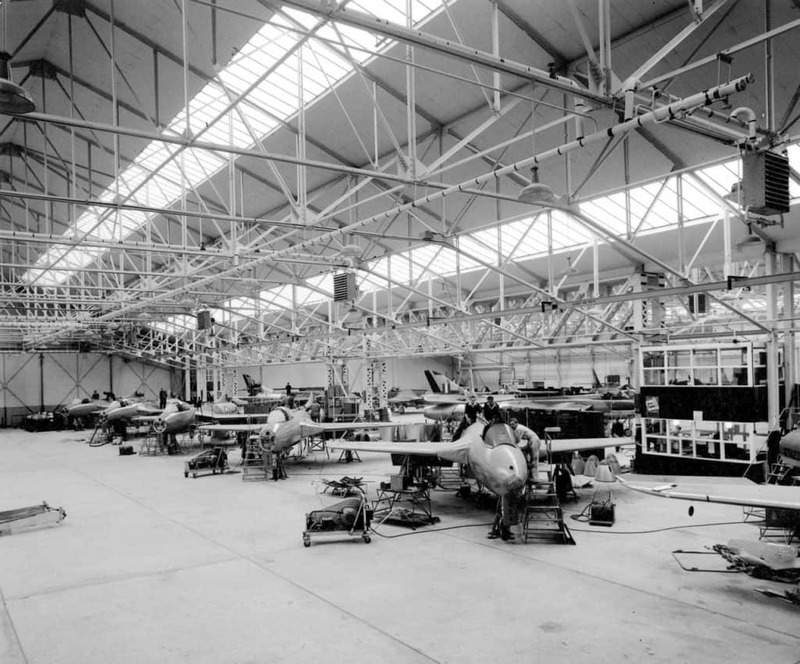 Production Apron aircraft preparation for flight tests, neg number H2450 21-06 -1954. In this last photo it looks like WT591. Aircraft on charge of the RAF DFLS (Day Fighter Leader’s Squadron). It skidded on ice on landing on 24/1/1957 at RAF West Raynham, Norfolk. Aircraft overshot and hit the boundary fence, shearing off the starboard undercarriage leg. 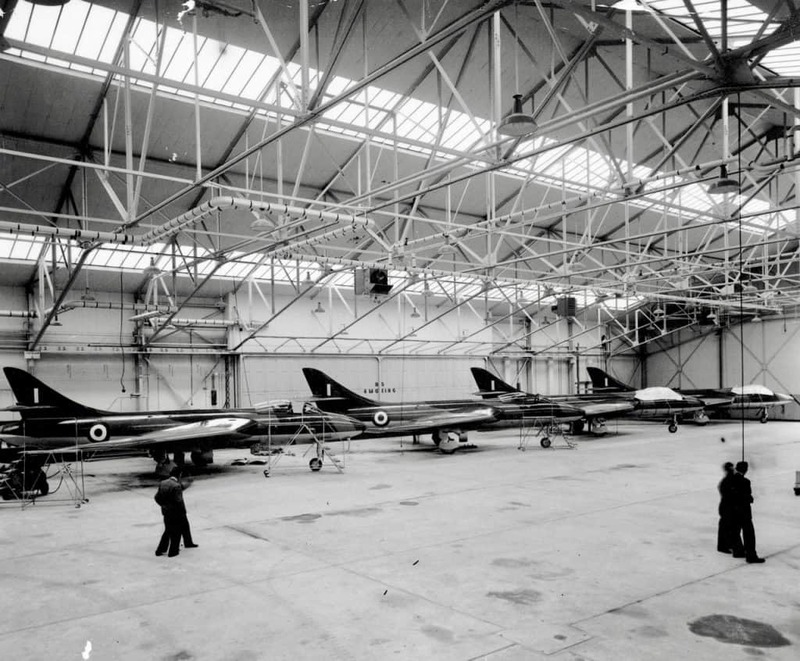 Struck off charge as Cat5(G/I): Allocated to Ground Instructional Airframe use as 7411M at 1 SoTT at RAF Halton on 23/4/1957. Not used as such, instead re-classified as Cat.5(c) at 19 MU RAF St. Athan on 26/4/1957. Re-classified Cat.5(scrap) struck off charge and moved to fire dump 17/5/1957. WT581 is at the back left. A tragic story is associated with this aircraft. It ran out of fuel at the end of an air test including aerobatics and manual landings. Crashed 1 mile west north west of Leuchars after the engine cut on final approach. Pilot – Flying Officer Alan MacKillop-Watkinson – ejected too low (at 250 – 500 feet) did not separate from the seat, and was killed. 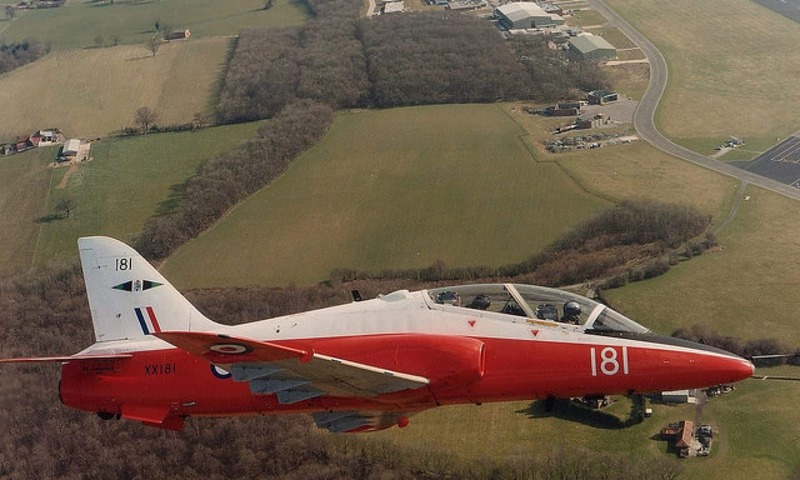 Previous PostPrevious Could Red Arrows ‘come home’ to Dunsfold?